Collateral are the latest big thing on the Rock scene. This type of statement normally ends in disappointment but in this case, these guys could well make it. On the back of an exceptionally catchy and professional EP entitled ‘4 Shots!’, the band has issued their debut single ‘Midnight Queen’ to wide acclaim. With the song’s re-mix for radio carried out by Grammy-nominated Romesh Dodangoda, the auspices were right for Collateral’s headline appearance in Camden’s The Black Heart. 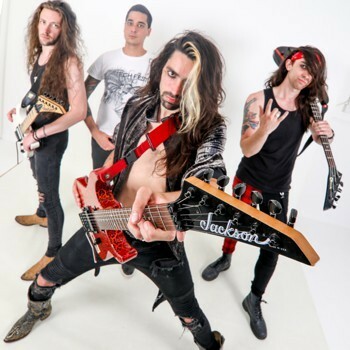 Collateral are a four-piece Classic Rock band with very a heavy lean towards the Sunset Strip Sleaze Rock scene, they took to the stage with aplomb and rapturous applause from an audience who knew this group are special. Lead singer Angelo Tristan and bassist Jack Bentley-Smith, who formed the nucleus of the band a few years back, are now with Todd Winger on guitar and drummer Ben Atkinson, and they certainly look and sound the part. Bearing in mind this is no vanity review just because they got me a drink, they acted on stage as if they were Bon Jovi after they released ‘Slippery When Wet’. The endorsement from Paul Anthony from Planet Rock certainly set the scene as he announced the group. The tumultuous crowd in this modest venue provided an ideal situation for Tristan. He whirlwinded his way through EP tracks such as the heavy ‘Going With The Wind’, which worked really well live, plus older songs that the loyal fans knew off by heart. There were references to a future album and with the eighty minute set containing all their own songs, the band are certainly not short of material. Never away from Tristan’s faithful semi-acoustic guitar, he loitered a bit too long sometimes in ballad territory but ultimately brought things back to soaring anthems or back-to-basics Rock. Collateral are a great example of NWOCR (New Wave Of Classic Rock) and it was good to see that the audience consisted of a good mix of ages. Things heated up towards the end with some epic rockers, but the inevitable encore and current single ‘Midnight Queen’ stole the show. This band is clearly going places.